An investigation has shown a third of people asked by BBC Wales think immigration has had a negative effect on jobs and the NHS in Wales. 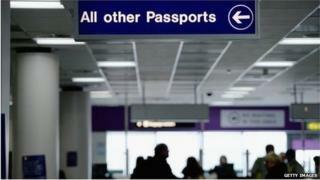 A survey of 1,000 people revealed more people believe immigration has had more of a negative impact than positive. Just under a half said it has made no difference, the Week In Week Out programme said. A quarter of people also thought immigration has had a negative impact on education. According to Welsh government research, there are now more than 30,000 children in Wales who speak English as an additional language. The government has spent £10m a year to help fund the extra staff needed. As immigration is expected to be a major talking point in the run-up to the general election, the programme has been to Merthyr Tydfil because the town has seen the most rapid growth in the immigration population in Wales. Week In Week Out: The Truth About Immigration in Wales, BBC One Wales on Tuesday 24 February at 22:35 GMT.